20 beds for white patients; as many for Negroes. Wilson Daily Times, 22 August 1941. This hospital was not Eastern North Carolina Sanatorium (now Longleaf Neuro-Medical Treatment Center), which was under construction when the above facility opened and admitted its first patients in January 1943. It seems a curious duplication of scarce resources to build two TB hospitals essentially simultaneously in one small city. By the 1970s, the Wilson County Tuberculosis Hospital building at 1808 South Goldsboro Street housed the offices of the Wilson County Cooperative Extension agency. It now houses the Wilson County Senior Activity Center. Photo courtesy of Wilson County Senior Activity Center Facebook page. The first and only home for tuberculosis negroes. The Journal of Outdoor Life: The Anti-Tuberculosis Magazine, vol. XI, January 1914. 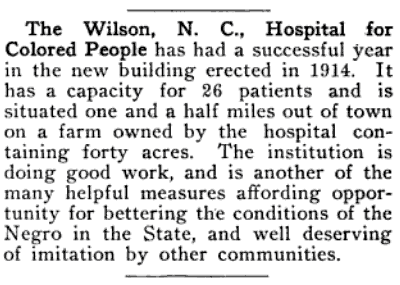 Founded in 1913, the Wilson Hospital and Tubercular Home (later known as Mercy Hospital) was one of a handful of early African-American hospitals in North Carolina and the only one in the northeast quadrant of the state. Though it struggled financially throughout its more than 50 years of operation, the hospital provided critical care to thousands who otherwise lacked access to treatment. A small cadre of black nurses assisted the attendant physicians. One was Henrietta Colvert (1893-1980) shown below at far left. A native of Statesville in North Carolina’s western Piedmont, Henrietta received training at Saint Agnes School of Nursing in Raleigh. How and when she came to Wilson is unknown. However, this photograph suggests that she cared for Mercy’s patients in its earliest days as the man seated in the middle is hospital founder Dr. Frank S. Hargrave, who left Wilson for New Jersey in 1924. The man at right is Dr. William A. Mitchner. Photograph of staff courtesy of the Freeman Round House Museum, Wilson; photograph of hospital taken by Lisa Y. Henderson, June 2013. New Charlotte Medical Journal: A Southern Journal of Medicine and Surgery (January 1916). A forty-acre farm situated a mile and a half outside of town?? ?